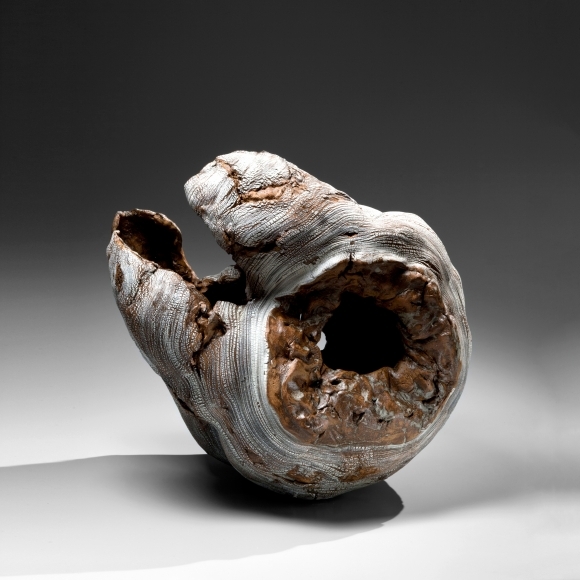 COLLAPSE/REBIRTH: Sculpture by Fujino Sachiko and Futamura Yoshimi April 26 – May 27, 2016 Joan B Mirviss LTD 39 East 78th Street NYC An art inextricably linked to the five elements of earth, wind, wood, metal and fire, ceramics have been created as reflections of nature from their very beginning. As a testament to this fact, Joan B Mirviss LTD is pleased to announce the opening of the joint exhibition, Collapse/Rebirth: Sculpture by Fujino Sachiko and Futamura Yoshimi. For this show the two artists have each created a body of work that, while aesthetically different, complement each other in theme. Fujino’s smooth, layered forms evoke the beauty of a flower about to blossom, while the rough, cracked surfaces of Futamura’s sculptures suggest the hidden, mysterious side of nature. This juxtaposition reminds us of a balance that can only be governed by the natural world- a cycle in which collapse kindles rebirth. FUTAMURA YOSHIMI (b. 1959): Nagoya-native Futamura was traditionally trained at the Seto School of Ceramics in 1979 where she first embraced the techniques of the historic Seto ceramic center, one of the Six Old Kilns. She moved to France thirty years ago and her recent work has truly matured with an elegant, Parisian flair. Futamura begins on the wheel, creating a tubular form to which she applies a white porcelain slip. The dried slip cracks as she manipulates the shape from the inside out, perforating, tearing, and expanding the clay before drying then firing. The result is the textured, geological forms for which she is best known. Through this innovative process, Futamura reveals the power inherent within her medium. The deep cavities in her work that accompany fissured surfaces seem on the brink of bursting into expansion or sinking into collapse. Despite her move to Paris, Japan unquestionably remains deeply rooted in the heart of her artwork. This exhibition is part of Futamura’s continued response to the tragic Tōhoku earthquake and tsunami of March 11, 2011, that took place while she was preparing for a solo exhibition at Musée Ariana in Geneva, Switzerland. This disaster profoundly shook Futamura, who suddenly realized that even her tranquil birthplace was vulnerable to the whims of nature. As Futamura states: “My work represents a fear for the uncertain, a force beyond our control which threatens to extinguish everything, even the desire for rebirth. The Tōhoku earthquake reminded me of how grateful I am to have grown up in Japan, as I could not be where I am today without its cultural influence. It is my hope that this exhibition introduces art to America that embodies a Japanese foundation with a Parisian essence.” Futamura has received numerous honors for her work. Most recently, she has been included in the current CERAMIX Cité de la Céramique-Sèvres-Maison Rouge-Paris, France that traveled from the Netherlands this year. Museums with works in their permanent collection include the Brooklyn Museum, NY; Lowe Art Museum, FL; Musée de Céramique d’Andenne, Belgium; Musée Français de Céramique de Fuping, China; New Orleans Museum of Art, LA; Samuel P. Harn Museum of Art, FL; Yale University Art Gallery, CT and more. For more information or to request high-resolution images, please call 212-799-4021 or email director@mirviss.com.